This summer I tried my hand at gardening for the first time! I haven’t posted about the process yet but posts are coming! I started my basil inside in early May. It was a slow start. The sprouts were so tiny and fragile and I definitely thought they weren’t going to grow. Well, I was very wrong. I transplanted them outside into a pot while I was still building my garden base. They looked so pathetic. Within a week or so, they got much stronger and I had a few little sturdy basil sprouts. About two inches tall. I transplanted the basil once again, this time into my garden and it took off! I have had more basil than I’ve known what to do with. Here’s one of the recipes I’ve made this summer. The recipe is very simple. Let the butter get to room temperature then mix in the basil and seasoning. 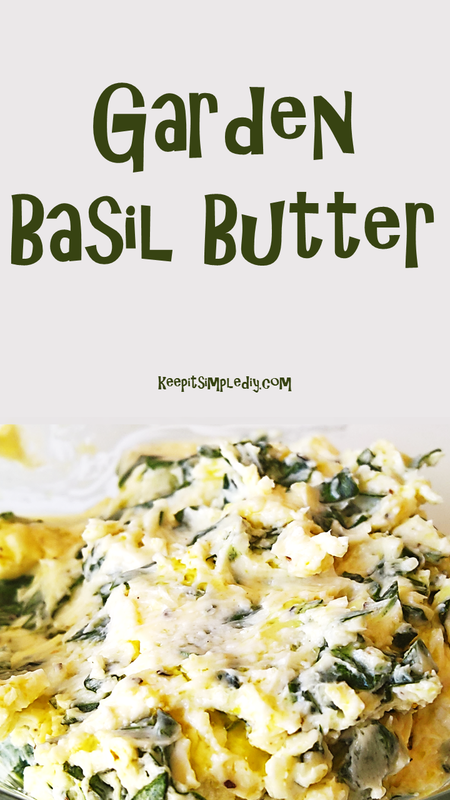 Keeping it simple with a great and easy basil butter. Compound butters make great gifts to go in food baskets. I love fresh basil! My mom grows herbs and I love cooking with them. But she’s in the next state and I haven’t had time to start my own garden. Maybe I’ll do that this spring, because I would love to try that butter! I think I’d put it on everything! Looks delicious, I have to try it!! Oh my gosh! I bet this adds so much flavor to different recipes. Great idea! This is a great, easy way to add more flavor to butter – love it! I love flavored butters! These sound so so good. I love flavoured butter, I have to try this recipe sounds so good. It would taste so good with a muffins or english muffin. Corn bread is s user good idea too. I actually made cornbread to go with it. The post will be up in a week! I love basil. Such a versatile herb but I have never attempted to use it in a butter. Sounds incredible especially in that corn bread recipe- yummy!